Borussia Dortmund vs Real Madrid – Tuesday 19:45BST/20:45CEST – BVB Stadion, Dortmund. Once again, the UEFA Champions League gods have summoned Dortmund and Real Madrid together to face each other in another set of group fixtures. Dortmund are flying high at the top of the Bundesliga while visitors, Real, are unusually off the pace in La Liga. Matchday 1 in the Champions League saw a reversal in current fortune as Real comprehensively beat APEOL. Meanwhile, BVB had a night to forget at Wembley—Borussia Dortmund were picked off at will by a rampant Tottenham Hotspur. Die Schwarzgelben are the early pacesetters in Germany’s Bundesliga—scoring at will they currently sit top of the table with 16 points from their opening six matches. Head Coach, Peter Bosz, has had an unbelievable start to life at the Westfalenstadion — before Saturday’s 6:1 demolition of Gladbach, Bosz became the first Dortmund coach ever to have kept a clean sheet in his first five Bundesliga matches. He will though, now hope that Dortmund’s league form translates into Champions League success. With an opening matchday defeat at Wembley, Dortmund desperately need points from their first home fixture of 2017/18s competition. Their display against Tottenham was by no means poor, but the way in which their London hosts exposed and punished some mistakes, especially down the right, will be an area of opportunity that will not have been lost on Real Madrid. Home advantage should be critical for the Dutchman’s high fliers; a passionate crowd will ensure the tempo is kept high. 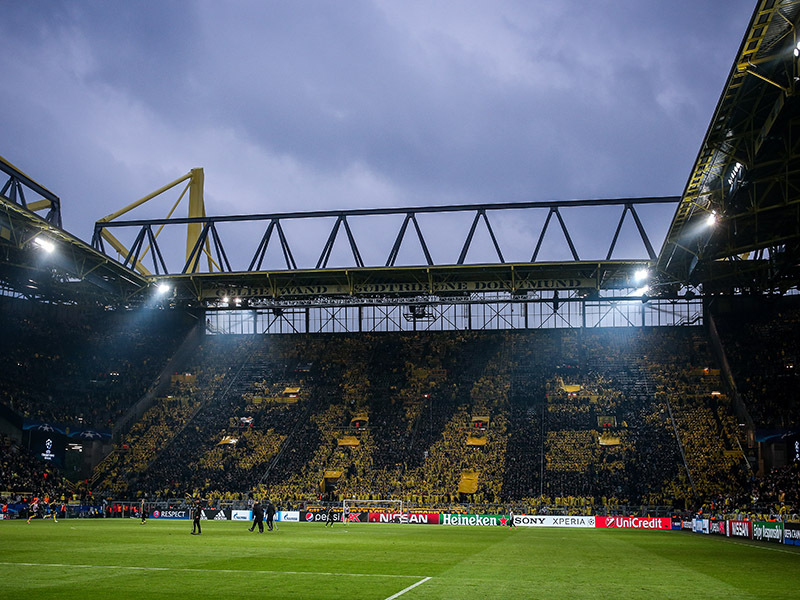 If Dortmund can carry forward their domestic form into this fixture, the back-to-back Champions from the Spanish capital could be in for an awkward night. Real Madrid currently sit fourth in La Liga—looking up they can see Sevilla, neighbours Atlético and main rivals Barcelona, who top the table after six matches. An important victory against Alavés on Saturday ensures Los Blancos travel to Germany on a high. Real have never won in Dortmund – and despite recent successes, have historically struggled in away games against Bundesliga sides. They will though, look back to last season’s quarter-final first leg against FC Bayern München for inspiration – Cristiano Ronaldo scored both crucial away goals on a historic night in München for the Spanish champions. Injuries have been the biggest problem for Head Coach, Zinedine Zidane, to try and work around. German national player, and World Cup winner, Toni Kross is a doubt after sustaining a repeat rib injury which has blighted the midfielder previously. The Frenchman is also unable to call on Marcelo or his backup Hernandez. Striker Karim Benzema is also unable for selection as are Kovacic and Jesus Vallejo – Real’s injury list has become a worry. The Ukrainian arrived at Dortmund just before the summer window closed. A €25m transfer from Dynamo Kyiv finally saw the 27-year-old join the club he had so frequently been linked with in the past. His three appearances in the Bundesliga have yielded three assists, but he’s been unable to find the net as of yet. However, it is in the Champions League where he has introduced himself to the Dortmund faithful. His goal against Spurs on the last matchday was indicative of his ability. Powerful, strong and standing at 6ft 2” he likes to drive at defences – one on one he can be devastating. If you were to cut Ramos open he would bleed white, such is his love for the club he has been with for 12 years. During that time, he has won every possible trophy – domestically and internationally. The only medal he doesn’t have is the Europa League, one the Spaniard will be quite content with. For a centre-back, he has an outstanding record further up the pitch. In 576 appearances for Real, he has scored an unbelievable 72 goals and assisted on another 38, a remarkable achievement for a defender. A captain and leader he brings a committed performance every time he pulls on the shirt. Dortmund will need to keep an eye on him during any offensive set-piece Real get; he is deadly in the air.